Shark is a classy, although formulaic investigative/courtroom drama series joining a host of similar efforts coming out of the States, such as CSI, Boston Legal, Law and Order and so on. The premise is nice....former top defence lawyer turned champion of the people for self-redemption...and the performances, scripts, production etc is of the high standard one would expect in this well proved line. 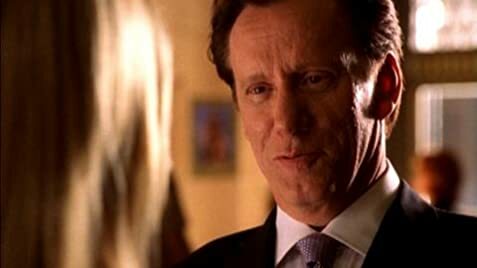 But what sets it apart and propels it to a different level is James Woods. Better casting for the part of the sharp, supremely confident and wise-cracking ("Don't shoot, this is a new suit")lawyer is impossible to imagine. In fact it is because he is so good that I rate the series as a 9 and not a 10. How does that work? Well, without Wood's brilliance the few scenes in which he does not appear seem unduly flat and tame by comparison. Unfair, I know, but Woods is that good. Sadly, the series is a one trick pony (crime-suspect-twist-shark prevails) which means it can't run forever, so get it while you can and immerse yourself in witnessing a true master of his craft revelling in a vehicle tailor made for his talents. The absence of Jeri Ryan (Jessica Devlin) from the season two episodes that were shot and aired after the 2007-2008 Writers' strike, is explained by saying that she is in Chicago caring for her ailing father. Raina Troy: When do these people sleep? Sebastian Stark: During the day. They're vampires. In Season One, Jessica's opponent in the race for the D.A. 's office is named Brian Cutler. He is never seen on screen, but people refer to him on multiple occasions. When Kevin Pollak begins playing the character in Season Two, his name becomes Leo Cutler.